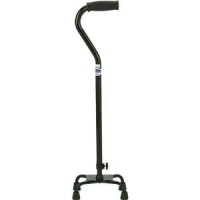 The Nova Quad Cane features a lightweight design and low center of gravity for greater stability and balance. The offset handle rotates for use with either the left of right hand. It is available in either a small or large base and with the standard offset handle or with an orthopedic support handle.